This app has some smart graphics and has a lot of good written content. The authors have also included a lot of background information about the contents, and the Cognitive Behaviour Therapy (CBT) approach of this app. Each of the four main tools has a comprehensive outline, with perhaps overly detailed instructions for how to use the app. It is feature-rich, which I think could distract from its main purpose, and some of the text I found to be a bit on the small side. This section of the app contains a very extensive bank of activity ideas, from which you can select ones that you would like to ‘commit to’. You can create your own activities, review your commitments, share them, add them to your calendar, and mark them as completed. You can browse through a list or category of activities, but by responding to a set of questions, the app can suggest suitable activities to address particular areas that you feel you are less involved in (eg socialising, physical activity, healthy lifestyle). This section of the app may be very useful for someone looking to stretch themselves and test some of their assumptions. It presents an interesting mix of approaches, ranging from behavioural experiments to behavioural activation exercises. I found this feature quite rigid and not very supportive. Its linear process requires you to challenge the thought, identifying thought errors and modify the thought and re-evaluate the emotion all in one sitting. The journal feature is really just a record of your engagement with other sections of the app. 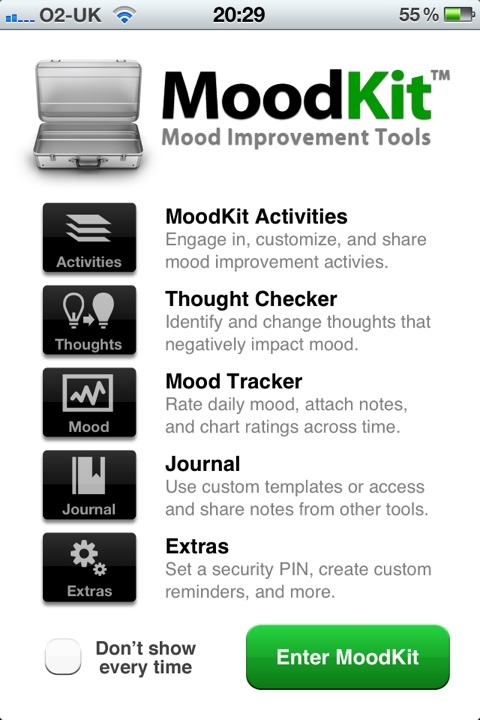 You can use it to review your thought diary, mood and activity notes. I think the best feature of this section, if not the whole app, is the template entries, which present a really helpful structure or series of questions for you to record goals, activity outcomes and reflections on your progress. Some of these entries are quite direct, but contain well crafted questions, some of which address issues such as goal setting, problem solving and motivation. I initially found the controls for this mood tracker quite clumsy, particularly the oversized dial. I really like the note feature which asks you to reflect on ‘What factors contributed to your mood rating?’. The chart graphic tracking your mood ratings is very smart looking, and a highlight of the app in my opinion. However, I think it is an oversight not to have included time of day resolution in the mood tracker, rather than just the date. A really interesting, but relatively hidden feature of the app is the ability to set reminders for activities, thought records or mood tracking. This has the potential to encourage more consistent and sustained engagement with some of the exercises. This entry was posted in Cognitive Behaviour Therapy (CBT), iPhone Apps and tagged iphone. Bookmark the permalink. Both comments and trackbacks are currently closed.